A contemporary, comprehensive upper level volume for postgraduates and researchers. Sponsored by the ASA and authored by leading global scholars, it is a landmark handbook in the field. This title can only be ordered as part of Wheelers ePlatform - a library lending platform for schools and public libraries. Log in with an ePlatform enabled account. In two volumes, the SAGE Handbook of Social Anthropology provides the definitive overview of contemporary research in the discipline. It explains the what, where, and how of current and anticipated work in Social Anthropology. With 80 authors, contributing more than 60 chapters, this is the most comprehensive and up-to-date statement of research in Social Anthropology available and the essential point of departure for future projects. -Part I: Interfaces examines Social Anthropology's disciplinary connections, from Art and Literature to Politics and Economics, from Linguistics to Biomedicine, from History to Media Studies. 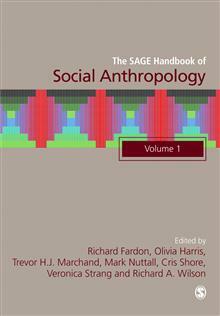 Edited by the leading figures in social anthropology, the Handbook includes a substantive introduction by Richard Fardon, a think piece by Jean and John Comaroff, and a concluding last word on futures by Marilyn Strathern. The authors - each at the leading edge of the discipline - contribute in-depth chapters on both the foundational ideas and the latest research. Comprehensive and detailed, this magisterial Handbook overviews the last 25 years of the social anthropological imagination. It will speak to scholars in Social Anthropology and its many related disciplines. Richard Fardon is Professor of West African Anthropology and Head of the Doctoral School at SOAS, University of London. He writes as a social anthropologist and an ethnographer of West Africa with wide interests that include art, intellectual history, religion, politics, and identity. Olivia Harris was a Professor of Anthropology at LSE and served as head of the Anthropology Department from 2005 to 2008. Trevor H.J. Marchand was born in Montreal, Quebec. He is Emeritus Professor of Social Anthropology at the School of Oriental and African Studies (SOAS), London, and is recipient of the Royal Anthropological Institute's Rivers Memorial Medal (2014). He was trained as an architect (McGill), received a PhD in anthropology (SOAS), and qualified as a fine woodworker at London's Building Crafts College (2007). During the past 25 years, Marchand has conducted fieldwork with craftspeople in Nigeria, Yemen, Mali, and London. His research has been supported by prestigious grants from the British Academy, the Economic & Social Research Council, SOAS, the Aga Khan Trust for Culture, and the Canadian International Development Agency. His books include Craftwork as Problem Solving (2016), Making Knowledge (2010), The Masons of Djenne (2009), Knowledge in Practice (2009, with K. Kresse), and Minaret Building and Apprenticeship in Yemen (2001). The Masons of Djenne was winner of three international prizes, including the African Studies Association Herskovits Award. Marchand's documentary films include The Art of Andrew Omoding (2016, for the UK Radical Craft Exhibition), The Intelligent Hand (2015), Masons of Djenne (2013, for the Smithsonian Institution), and Future of Mud (2007, with S. Vogel). He has curated exhibitions for the Smithsonian's National Museum of Natural History (Mud Masons of Mali, 2013 - present), the Royal Institute of British Architects (Djenne: African City of Mud, 2010), and the Brunei Gallery in London (Yemen: Space, Place & Architecture, 2017). Marchand's forthcoming monograph is titled The Pursuit of Pleasurable Work. The motivation behind his research is to challenge popular ideas about the value and intelligence of skilled craftsmanship. Professor Cris Shore is Chair in Social Anthropology at the University of Auckland, NZ. Professor Veronica Strang is Executive Director of the Institute of Advanced Study at Durham University. Richard Ashby Wilson is the Gladstein Distinguished Chair of Human Rights and Professor of Law and Anthropology at UConn Law School, and founding director of the Human Rights Institute at University of Connecticut, US.